Offering you a complete choice of products which include Aluminum Labels such as Anodic Printed Aluminum Labels, Anodized Aluminum Labels and Deep Etched Aluminum Labels. 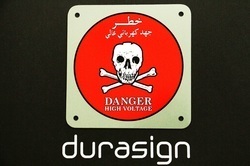 Our company is the major in offering Aluminium Signs to the clients. Aluminium Signs are manufactured by proficient professionals using ultra-modern technology and superior quality components in compliance with industry slandered norms. Offered range is extensively appreciated by valuable clients for long lasting strength and other superb attributes. These products are checked stringently on certain quality stages before final delivery. Offered range is available to clients in various technical specifications to fulfill various needs. Our company is widely appreciated in offering Aluminium Etching to the clients. Aluminum Etching is manufactured by skilled professionals using high quality raw material and advanced technology in adherence with industry set standards at well developed production unit. Offered range is tested on the entire array with help quality examiners team. This product can be modified keeping in mind the varied needs of valuable clients. Offered range is widely praised by clients all around the nation for attributes like attractive look and excellent finish. We are engaged in providing Anodized Aluminum Labels which are made by the process of penetrating anodized dye in aluminum. 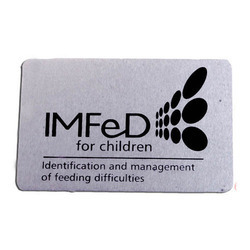 Made available in different sizes and shapes, these labels are widely used as displayed in exhibitions, door nameplates, flat numbers and others. Once anodized, any graphics or lettering style can be added to the aluminum labels, in order to keep up with the different needs of the clients. We are the prominent manufacturer, supplier and exporter of a vast collection of Anodic Printed Aluminum Labels, which are made available in different sizes and thickness. Ideally suited for exterior use and conditions such as harsh environments and extreme temperatures, these labels are made from anodic dye penetrated deep into the aluminum. These labels combine an attractive appearance with excellent durability. Aluminum Labels is our very popular product in industry. 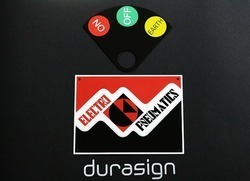 The variety of signage production available in this type is - anodic printed labels, dyeing labels, engraved labels, etc. The list is endless. In this variety cost effectiveness is the key factor. Paint filled etched label 0. 2 to 3 mm 1220 x 2440 Self adhesive or reverting console Raised or sunk graphics with automotive paint filling Durability, outdoor application, excellent shelf life, economical , small qty. Production possible. 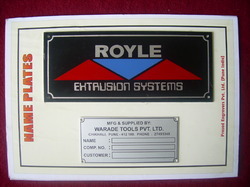 Anode printed label 0. 2 to 3 mm 1220 x 2440 Self adhesive or reverting console Multicolor plain label printed with oven baked ink Durability, ideal for outdoor application, excellent shelf life, economical, small qty. Production possible. This is our very popular product in industry. The variety of Anodized Aluminum Labels having endless list. In this variety cost effectiveness is the key factor. Durability, outdoor Application, excellent shelf life, economical, small qty. Production possible. Durability, ideal for outdoor application, excellent shelf life, economical, small qty. Production possible. 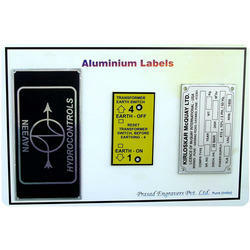 Looking for Aluminum Labels ?